There’s another really great coupon available over at Amazon.com. You can get the Philips Norelco 1150x/40 SensoTouch electric shaver for only $49.97 with the $30 off instant coupon. That is a huge savings, this razor is normally $99.99. Head over to Amazon.com and see this deal plus all the other great coupons they have available. You can still get this in time for Christmas too and shipping is FREE with Amazon Prime! Philips Sonicare Hx5351/30 Essence Power Toothbrush only $27.99! This offer is back and even better! Amazon.com has the Philips HX5351 Sonicare Toothbrush for $37.99 today, regular price $69.99. BUT they also have a $10 off instant e-coupon available for you to use making this a steal at $27.99! Head over to Amazon.com to get this deal and see all the other coupons they have too! *All coupon discounts are applied at checkout. Hurry! This deal is not going to last! Amazon.com has the Philips HX5351 Sonicare Toothbrush for $39.99 today, regular price $69.99. BUT they also have a $10 off instant e-coupon available for you to use making this a steal at $29.99! There is a hot coupon for $10 off Philips Norelco Stubble Trimmer, QT4022 over at Coupons.com. With this coupon, you can get an amazing deal on a trimmer at both Walmart and Target. This makes a perfect gift for Christmas! 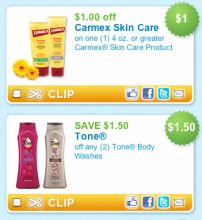 Coupon Alert: Carmex and Tone Body Wash Printable Coupons! There are two new coupons available that you don’t want to pass up. Head over to Coupons.com and print the $1/1 4oz. Carmex coupon and the $1.50/2 Tone Body Wash coupons. Both of these will get you very cheap if not free deals at the drugstores! If you can’t locate these coupons in your location, use zip code 94127. 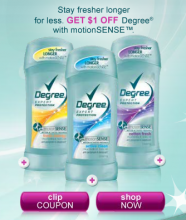 Head over to Walmart.com, they have a great $1/1 Degree motionSENSE printable coupon available. This will make for some really good deals at the drugstores! o.b. is offering a free travel pack with samples. It’s actually a cute little container that you can easily keep in your hand bag. Head over to o.b. and grab your free sample while it’s still available. New $1/1 Listerine Printable Coupon = 2 Free at Walgreens! There is a NEW coupon available for you to print, you’ll be able to get Listerine Whitening + Restoring Rinse FREE when combined with the Register Reward deal and the In-Ad Coupon from this weeks store ad. This coupon has no size limit, making this a great deal! Here’s how to get two Listerine Whitening + Restoring Rinse for FREE. * There are two Listerine coupons available, make sure you print and use the Listerine Whitening Rinse. Head over to Coupons.com and grab this great printable $1/1 Dove+Men or Degree deodorant coupon. You can stack this coupon with the Target printable coupon available, getting $2 off! This could mean for FREE deodorant depending on your local Target price. You should print both of these coupons before they reach their limit. They tend to go very quickly! If you don’t see this coupon in your zip code, it likely reached the print limit for that region. So try another zip code far away. Here is a great deal still going on at Walgreens. Get the Tylenol Precise pain releaver patch or cream for FREE after you stack the store coupon (available in stores) and the manufacturer coupon!